Hello everyone! I never post on a weekend but I wanted to just post up a personal chit-chat type of post today about my stash/hoard. And in the second picture that isn’t all the makeup and skincare products I own it’s gotten really out of hand and not everything I purchase is shown in the second photo. Obviously something must be done so that I have a reasonable size amount without overwhelming myself everyday. 2. Continue on with Empties – I find that photographing my empties motivates me to use up more products so motivation is good. 3. Use a mask every second day – I didn’t picture it above but I have a substantial stash of sheet masks and other masks as well so to use up this stash I will aim to use at least 3/4 masks per week. 4. Think before I buy – I impulse buy quite a bit so this is great as an exercise for me to see if I have something similar in my stash that I could just pull out and if I really want to purchase it that item will count as my product limit. 5. 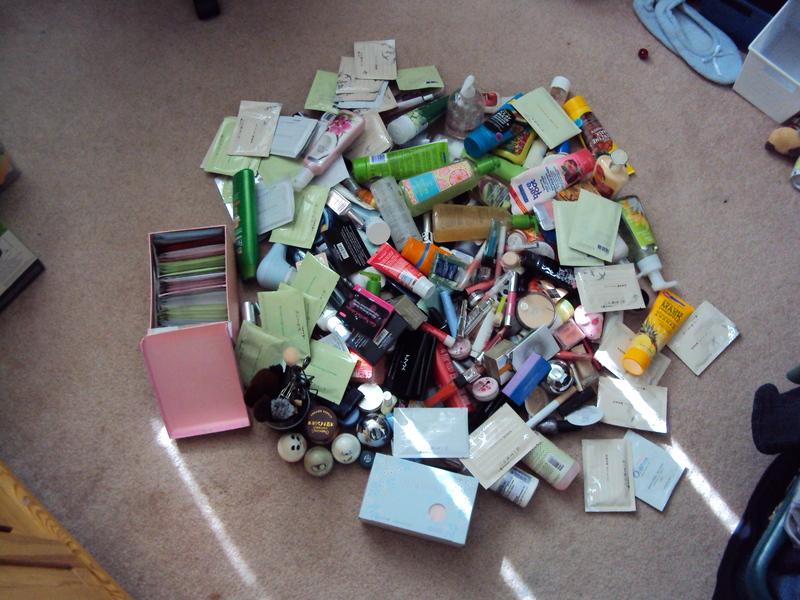 Time Limit – I have decided to give myself to the end of this year (Dec. 31, 2013) to see if my stash has reduced as well as to give monthly updates on how I am doing with the purchase limit, empties, and products I am almost done. 6. Review everything in my stash – I realize that I haven’t really reviewed everything on my blog from my stash (with some being limited edition etc.) but there are some items that I haven’t gotten around to reviewing so I should do that to see where my makeup stash is and when everything is reviewed I think I will be a happy camper and won’t complain if there is something that I haven’t reviewed yet. 7. Have a master list – I plan on creating a wishlist of sorts to see what I would like to purchase and to think about trying out. Not only that but I also plan on creating a list of Holy Grail items (items I would repurchase till the ends of time) and this will be sort of what I want my collection to look like if I started from scratch only using items that I seriously love. Exception: I realize that the Sephora VIB sale will occur in November this year and I will let myself go to the sale to purchase items either as gifts or as a treat to myself (a limit of 5 items for myself personally from this sale this number will not affect the monthly 5 items). Hopefully this will go as I plan but again I realize that it is hard to work on reducing my stash without being attracted to all the new stuff being released and such. 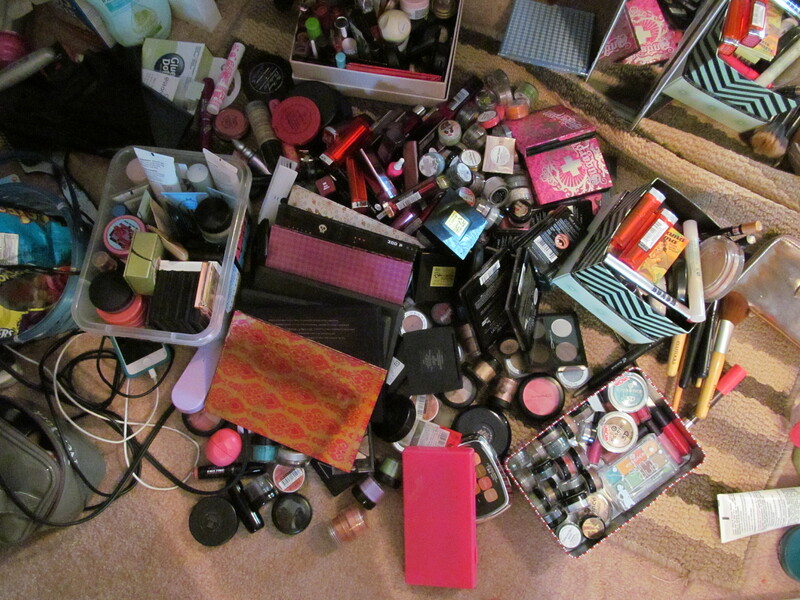 So to start documenting this I will start off with a collection overview and begin to work my way through the swamp I have created with the amount of beauty products that I have.